The working flair seminars are great to build your skill set behind the bar. We have the bottles, glassware and practice bits for you to start your flair skills. When you’re done with the class though… you will need a whole lot of practice. We also have a few official Flairco flair practice bottles at the school. Pick up a flair bottle, or two, to practice in your backyard. Demonstrate some of your mad skills in front of a small audience. Set yourself up in a park, or even the beach. Practice some of your bottle flipping flair in the great outdoors, without the fear of breaking your mom’s china. $25 per flair bottle, including tax! We have a few of these bottles at the school, both in 750ml and 1 litre sizes. Pick up one, or two to try your two handed bottle flips. PVC and polycarbonate construction on these give you the option of what you would like to practice with. 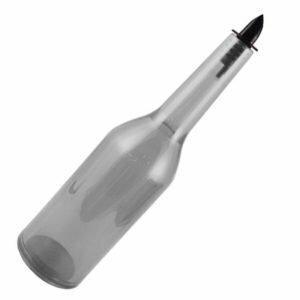 We do sell shaker sets too, in case you are looking for a shaker tin to practice catching one of these flair bottles in. Order through the website, or just drop by the school and pick one or two up! If you are looking for tips on what to do with a flair bottle, we do occasionally offer a working flair seminar. This is a 5-hour class dedicated to learning a few different and simple flair moves to boost your tips behind the bar. We don’t do many of these classes, so if you are interested definitely send us an email and we can notify you when we have our next flair class on offer. In the meantime, we suggest having a look at Youtube for the videos of what not to do when flipping bottles behind the bar. Customers are interested in being entertained by a bartender, but they don’t want to wait 2 minutes for their drink to be poured!